Thirty leaders and experts in the field of manta and devil ray conservation science have come together to identify major gaps in our current understanding and protection of these species. Their paper, published in September in Frontiers in Marine Science, synthesises what we do know about these rays, and highlights what needs to be done in the coming years to ensure their protection. We chat to lead author Josh Stewart from the Manta Trust and Scripps Institution of Oceanography about what this landmark paper means for conservation. This paper effectively evaluates the current status of manta and devil ray research and conservation: why should we be worrying about knowing more about this group of animals? 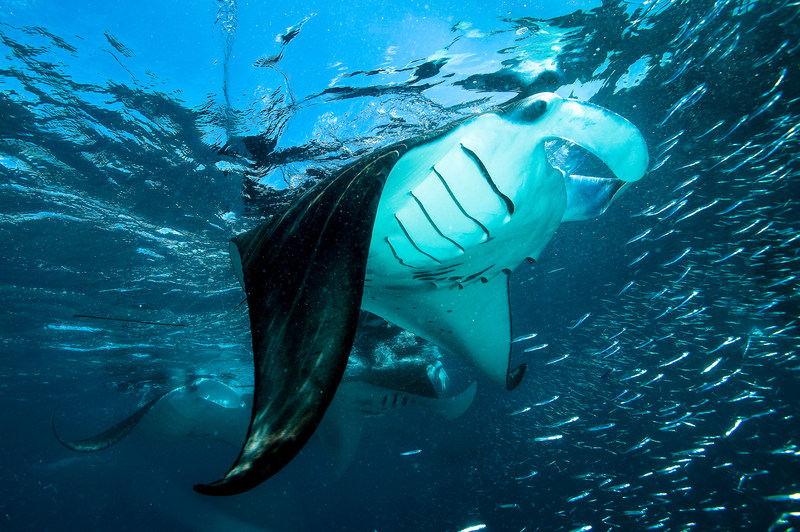 Roughly ten years ago, manta and devil rays came into the spotlight due to the growing trade in mobulid gill plates. This major Asian market was driving targeted fisheries for mobulids around the world (and retention as bycatch where previously they would be discarded), and marine conservationists realized that there was virtually zero information on how these populations would respond to such pressures. In response, there was a flurry of scientific activity to try to understand the intrinsic capacity of mobulids to respond to fisheries and capture any information on population trends that might be available. Since then, we have made a huge amount of progress in understanding the basic biology and ecology of mobulids, and there have been a number of very important high-level conservation and management actions put in place to protect mobulids. That said, given that we were starting from virtually no information, there are still so many knowledge gaps that need to be filled. While the major threat of targeted fisheries has been addressed in many locations (with the typical enforcement challenges), management largely has not begun to address other significant impacts such as bycatch, habitat degradation, and other sub-lethal stressors that are affecting mobulid populations. In order to develop effective, science-based management strategies, there’s a lot of research that still needs to be done. Our goal with this paper was to acknowledge that there are nearly limitless topics waiting to be addressed in mobulid biology, ecology and conservation, and focus those into the most important subjects for supporting future conservation and management efforts. Graphical table of contents/research topics and methods for use in different mobulid study systems. Superscript numbers refer to sections in the paper with detailed descriptions and recommendations for future research addressing each topic and using each method. Figure design by Madeline Wukusick www.communique.design. Mobulid telemetry effort to date. (a) Cumulative number of acoustic and satellite tags deployed on all mobulid rays from published literature by year. (b) Comparison of tagging effort to date for manta and devil rays. (c) Total tags deployed by species. Note that we specify tagging effort by IUCN species classifications, but use the same color for M. japanica and M. mobular, which have been lumped into M. mobular but have different IUCN Red List classifications. (d) Distribution of acoustic tag deployments on mobulid rays by species. (e) Distribution of satellite tag deployments on mobulid rays by species. What was most important to you in tackling this synthesis? In my opinion, the most important aspect of this effort was to bring together a diversity of backgrounds and experiences in mobulid research, hence our extensive author list. Every individual researcher is focused on a certain topic or topics, based on their personal interests or the issues that are most relevant to their study region/species/population. It was only by bringing together all of these experts that we could obtain a truly global overview of the situation, and create a list of recommended topics that would support conservation efforts across different regions, species, and management scenarios. Identifying the gaps means first consolidating and understanding what is already known. Was some level of existing cohesion and communication among researchers in this sector important to making this happen? As with most other fields, the world of mobulid research is split up into groups operating in different regions of the globe. While we sometimes see each other at conferences and collaborate on projects, there’s not always a huge amount of overlap in research efforts, and as a result communication can be limited. This synthesis paper was organized by myself, Fabrice Jaine, and Guy Stevens. Because all of us are working in different regions and on different topics, it provided a great opportunity to pull together different networks of researchers to collaborate on a unified effort. I think this was a great experience for all of us to work with other researchers whose work we were familiar with, but with whom we had never actually had the opportunity to collaborate. I hope it spawns some exciting future partnerships and creates a tighter network of experts around the world. How did you go about bringing everyone’s expertise together for comment and prioritization of knowledge gaps? As one large group, we first identified the major topics that should be addressed in the paper. From there, the authors split up into the subject areas that we had the most experience in. Each of the nine key topics in the paper had a section leader and four to five co-authors with expertise in that area. The subject leaders and groups then summarized the existing state of knowledge on the topic, and outlined priority topics for future research. So each section of the paper was led by a handful of experts who have spent considerable time working on those topics, and who were best equipped to identify the most pressing knowledge gaps that should be addressed. Were there any particular challenges in compiling all this information? Are there regions/experts that are underrepresented or missing from this paper that would require future investigation? The hardest part was boiling down all of the knowledge gaps into a manageable and useful document. Frankly, you could write an entire book on what we don’t know about mobulids. But identifying the most pressing knowledge gaps from a conservation perspective was both the most important and most challenging task. The longer a paper like this becomes, the less focused it is and therefore less useful for helping to direct future research efforts. So we had to make some tough decisions on what to keep and what to leave out—and even after all of that, it still felt like a bit of a behemoth! Needless to say, there are many fascinating topics that are very interesting from a basic science perspective and which no doubt will be addressed in the future. However we felt it was important to keep this focused on topics that would specifically support conservation and management. After all of that, several regions and species definitely stood out as underrepresented in the literature and deserving of targeted research efforts. The west coast of Africa in particular is a very poorly studied region and is important for mobulid taxonomy (one species in question is endemic to western Africa), fisheries and conservation. As far as species go, many of the smaller devil rays have been chronically understudied and will need future attention in the areas of reproductive biology, life history, and critical habitat use. Across species, we still know very little about the juvenile stage, which is important to population viability given how long mobulids take to reach sexual maturity. Bringing together expertise to hone priority questions and focus points for one paper is a feat in itself! What do you hope for future communication and collaboration to address the knowledge gaps that have been identified? How would you hope scientists avoid redundancy, streamline efforts and diversify tasks? I think that ultimately coordinating research efforts will come down to improved communication. It will be increasingly important for researchers to connect with each other to make sure that where overlap exists (which isn’t necessarily a bad thing! ), the studies are designed in such a way that results can be combined in future meta-analyses and syntheses. This has always been the case, but I think this paper is also a good reminder to closely review previous literature and make planning decisions based on what work has already been done. This may be as simple as programming tags to have the same settings as a previous study so the results can be combined, or using the same primers for genetic analyses as a previous study rather than using whatever your lab is most comfortable with. These sound like simple, obvious suggestions, but often they require considerable additional effort. One of our take-home messages is that the extra effort is worth it in the long run. What would you most like to see come of this effort? I really hope that this paper helps guide future research efforts for both new researchers starting work on mobulids, and for those of us who already have existing mobulid research programs. We’ve tried to organize the review so that, for example, a graduate student who is interested in studying mobulids can open up our paper, identify the study site or species they have access to, and easily determine what questions can and should be addressed and what methods might be appropriate to do so. The same goes for established researchers who have graduate students seeking projects or who are considering where to take their research program next. If we all strive to fill the key knowledge gaps identified in the paper, I think we can make a huge amount of progress towards improving the science-based management of mobulid rays in the coming decade.